Michigan’s Minimum Wage does not increase on January 1, 2019. Michigan's minimum wage will remain at $9.25 for hourly employees and $3.52 for tipped employees. On March 29, 2019, the new minimum wage will take effect and increase to $9.45 for hourly employees and $3.59 for tipped employees. In complete disregard to the 2014 bipartisan Minimum Wage law, the coalition identified as “One Fair Wage” which was almost entirely funded by out of state interests launched a ballot proposal for the 2018 November election. The ballot proposal sought to increase Michigan’s minimum wage to $12 per hour by 2022 while eliminating the tipped minimum wage “tip-credit” in Michigan by 2024. 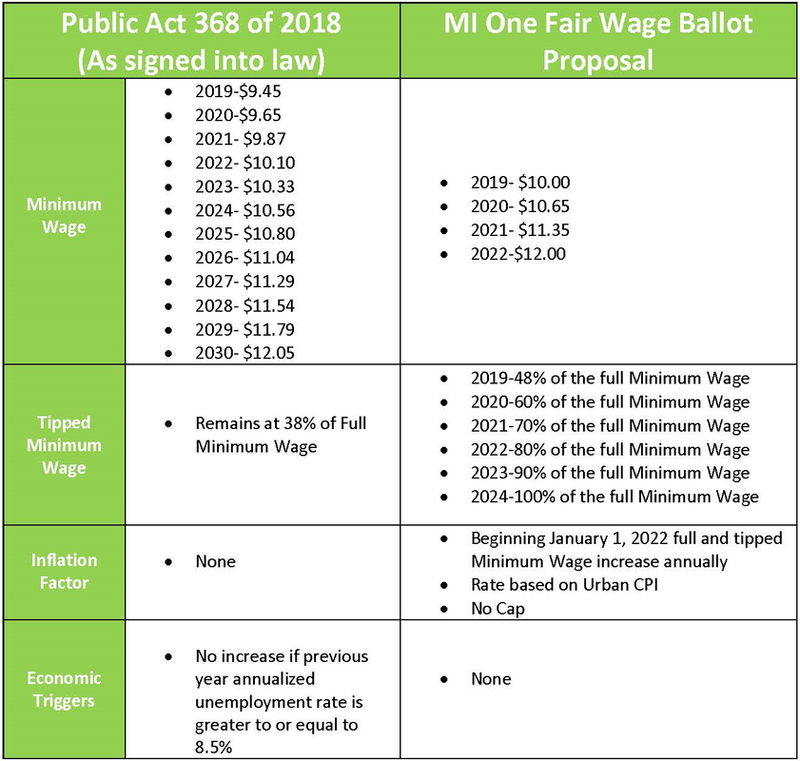 In an effort to prevent this ballot proposal from reaching the November 2018 general election ballot, the Michigan Restaurant & Lodging Association worked tirelessly with the Michigan legislature to have them adopt the MI One Fair Wage Ballot Proposal and prevent it from going to the ballot. As demonstrated in other states, if the MI One Fair Wage ballot proposal had gone to the November 2018 General Election Ballot, it would have passed with overwhelming support. Further, under Michigan’s constitution, the MI Legislature would have needed ¾ support in both the MI Senate & MI House to make changes ever again! However, since the MI legislature took the necessary steps to adopt the proposal, the MI House & Senate only needed a simple majority in both chambers to make the necessary changes to the new Minimum Wage Law. On December 4, 2018, the Michigan Legislature voted overwhelmingly to pass SB 1171 (now Public Act 368 of 2018) into law. Below illustrates Michigan’s new Minimum Wage Law.